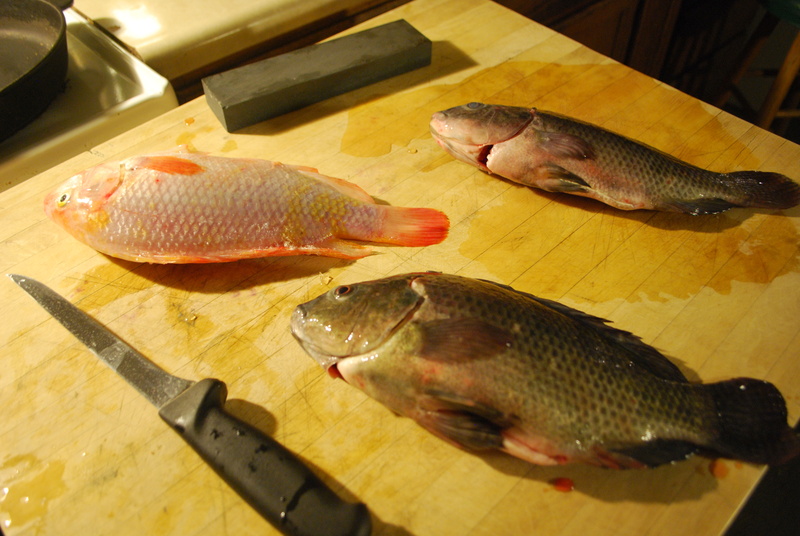 Somehow I ended up buying three live tilapia. Now what? First, I had to gut them. I figured it would be just like a trout. Turned out to be a bit more difficult. We used this video to figure it out. It really is as easy as it looks. Make sure your knife is very sharp. Try to get the biggest fish you can. I couldn’t tell any difference between the black and the white tilapia. Tags: fillet fish, fresh fish, live tilapia, Marty Camberlango. Bookmark the permalink. No recipe to go with this? Come on, Katie, it’s the one month a year when I actually eat fish!! You have to wait til the next post…..fish tacos, with the pineapple pico de gallo that I believe we also served with the pork we made at your house.